1. Preheat the oven to 100°C, gas mark ¼. Whisk the egg whites to soft peaks using an electric whisk then whisk in half the caster sugar. Gradually whisk in the remaining sugar, then whisk for a further 2 minutes until stiff and glossy. 2. Line 3 flat baking trays with baking parchment. Spoon a third of the meringue mixture onto each tray and use the back of a spoon to spread out to a circle roughly 22cm in diameter. Bake them for 1½ hours, swapping the trays over every 30 minutes, then turn the oven off and leave overnight to cool completely. 3. For the filling, whip the cream, vanilla seeds and icing sugar to soft peaks then fold through the coulis. Combine the diced fruit and lime juice in a separate bowl. 4. Just before serving, assemble the pavlova. Spoon a little cream into the centre of a serving plate or cake stand and lay one of the meringue discs on top (the cream will stop it from sliding around). Spoon over a third of the cream mixture and top with a third of the fruit. 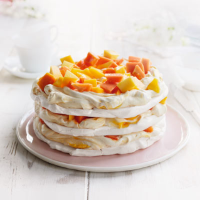 Add a second pavlova disc and repeat the layering, finishing with a layer of fresh fruit. This recipe was first published in Tue Mar 04 12:44:00 GMT 2014.